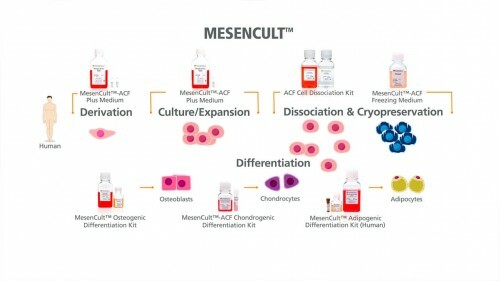 MesenCult™-ACF Plus Medium is a standardized, animal component-free (ACF) and serum-free medium for the isolation and culture of human mesenchymal stromal cells, also known as mesenchymal stem cells (MSCs). 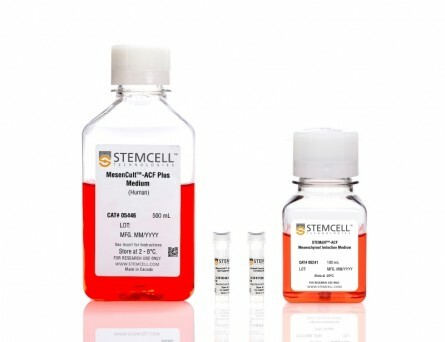 MesenCult™-ACF Plus Medium is optimized for the expansion of MSCs in vitro as well as their enumeration using the colony-forming unit-fibroblast (CFU-F) assay. 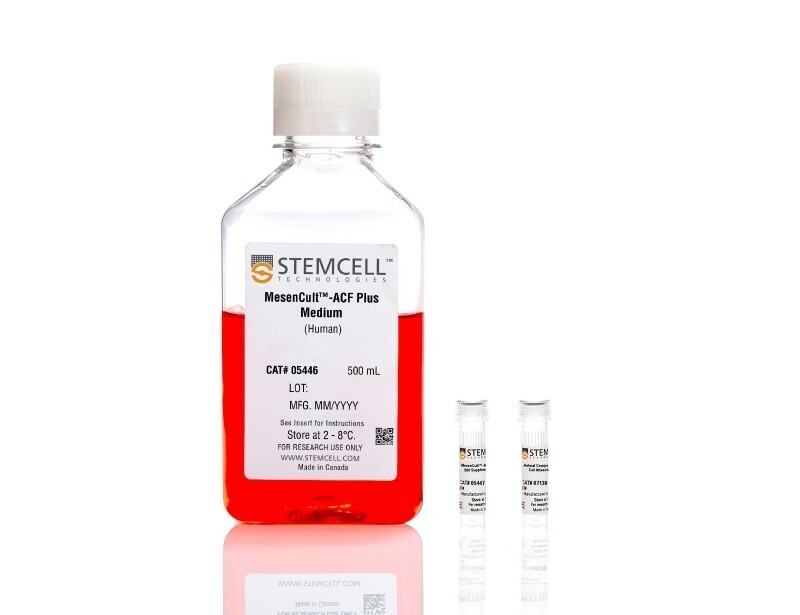 MesenCult™-ACF Plus Medium supports the isolation and long-term growth of human bone marrow-derived MSCs, and cells maintain robust multi-lineage differentiation potential in vitro. 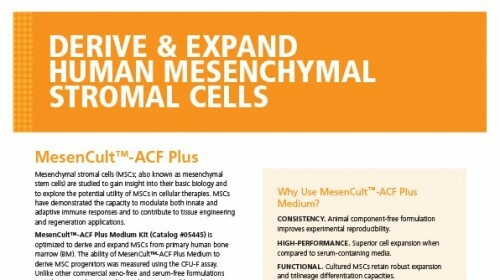 MesenCult™-ACF Plus Medium must be used in conjunction with Animal Component-Free Cell Attachment Substrate (Component #07130) and Animal Component-Free Cell Dissociation Kit (Catalog #05426), providing a complete, defined ACF culture system. 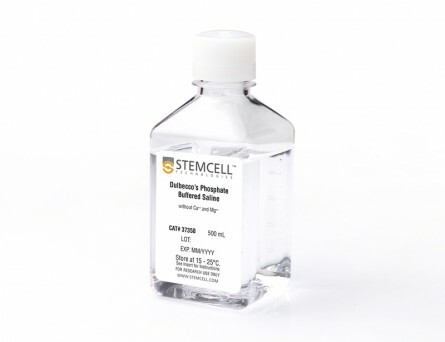 Components of Animal Component-Free Cell Attachment Substrate and Animal Component-Free Cell Dissociation Kit are prescreened and tested for optimal cell adherence when cells are cultured with MesenCult™-ACF Plus Medium. 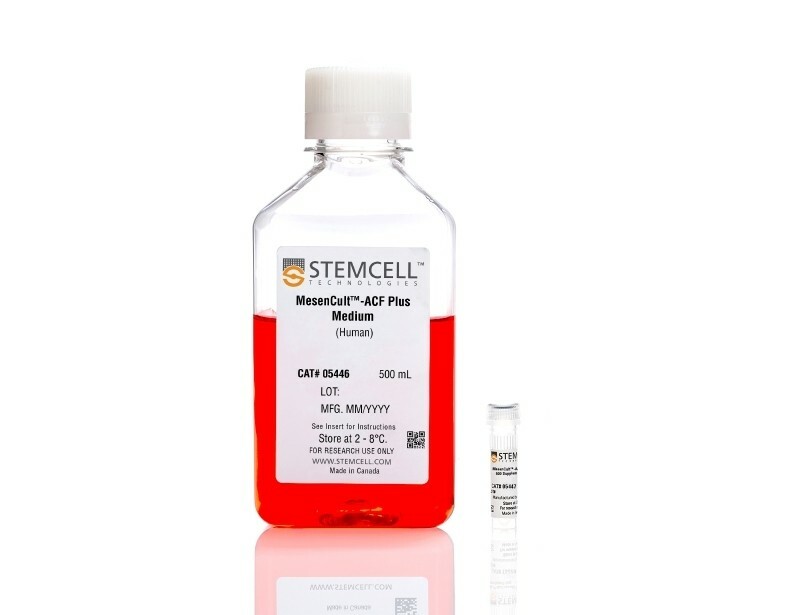 For animal component-free and optimized cryopreservation, MesenCult™-ACF Freezing Medium (Catalog #05490) is recommended for human MSCs previously cultured in MesenCult™ media, including MesenCult™-ACF Plus. 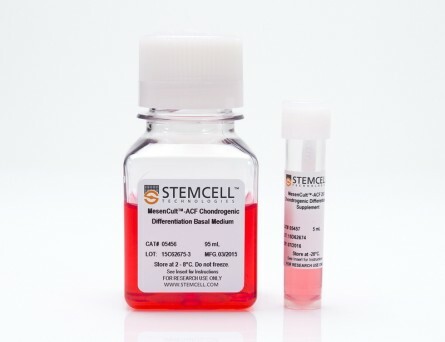 For a complete list of related products, including differentiation media available, visit www.stemcell.com or contact us at techsupport@stemcell.com. NOTE: Complete MesenCult™-ACF Plus Medium must be supplemented with L-Glutamine (Catalog #07100). • Animal component-free formulation improves experimental reproducibility. 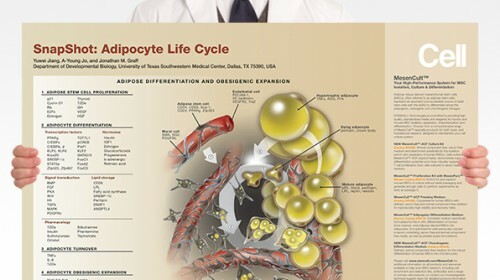 • Superior cell expansion compared to serum-containing media. 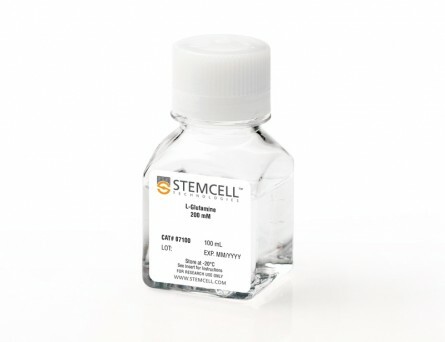 • Cultured MSCs retain robust expansion and tri-lineage differentiation capacities at early and late passages. • Supports MSC derivation directly from primary human tissue. Figure 1. 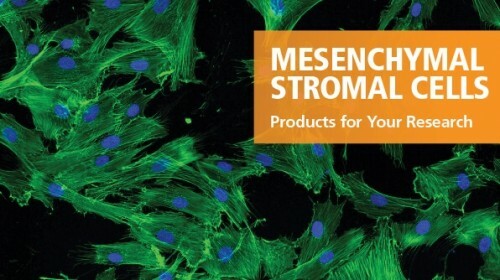 CFU-F Assay of Human BM-Derived MSCs Expanded in MesenCult™-ACF Plus Medium and Commercial Media. 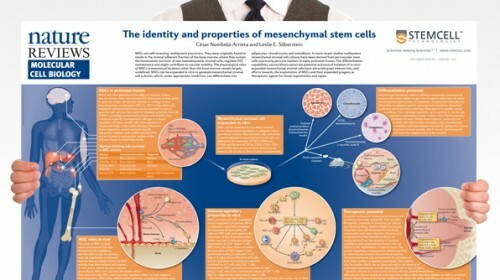 (A) An average of 45 CFU-Fs per million cells were observed when BM mononuclear cells were seeded in MesenCult™-ACF Plus (n = 4). 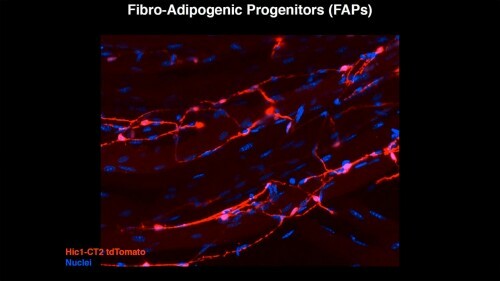 An average of 47 and 25 CFU-Fs per million cells were observed when cells were seeded in Commercial Medium 1 (n = 3) and Medium 2 (n = 4), respectively. Vertical lines indicate Standard Error of Mean (SEM). Representative image of CFU-F colonies expanded in (B) MesenCult™-ACF Plus Medium (9 days of culture), (C) Commercial Medium 1 (10 days of culture) and (D) Commercial Medium 2 (10 days of culture). 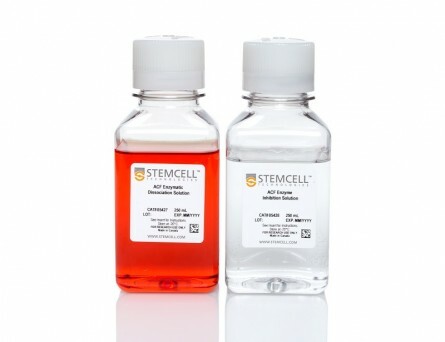 Commercial Medium 1 and Medium 2 were supplemented with 2.5% human AB serum to derive MSCs from BM, as per their protocols for derivation. 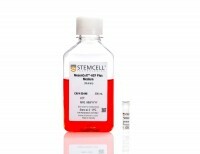 No addition of serum is required when using MesenCult™-ACF Plus Medium. Figure 2. 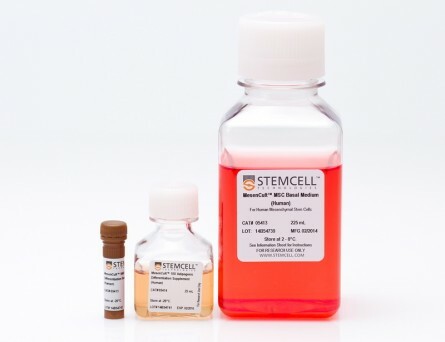 Human BM-Derived MSCs Cultured in MesenCult™-ACF Plus Medium Expand Faster than MSCs Cultured in Commercial Xeno-Free and Serum-Free Media. (A) A greater number of BM-derived MSCs were generated per passage using MesenCult™-ACF Plus Medium (n=4) compared to Commercial Medium 1 (n=3) and Commercial Medium 2 (n=2). (B) Rates of BM-derived MSC expansion were compared between MesenCult™-ACF Plus Medium, Commercial Medium 1, and Commercial Medium 2. 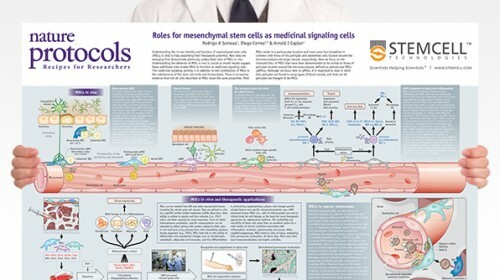 The time required to double the number of MSCs using MesenCult™ -ACF Plus Medium (n=4) was shorter than when MSCs were cultured in Commercial Medium 1 (n=3) and Commercial Medium 2 (n=4). Vertical lines indicate Standard Error of Mean (SEM). Figure 3. 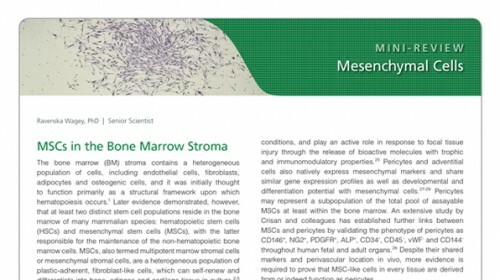 Human BM-Derived MSCs Expanded in MesenCult™-ACF Plus Medium Display Multi-Lineage Differentiation Potential. (A) Human BM-derived MSCs expanded in MesenCult™-ACF Plus Medium differentiated into (B) adipocytes (Oil Red O staining; passage 5), (C) chondrocytes (Alcian Blue staining; passage 4) and (D) osteoblasts (Alizarin Red S staining; passage 5). Figure 4. 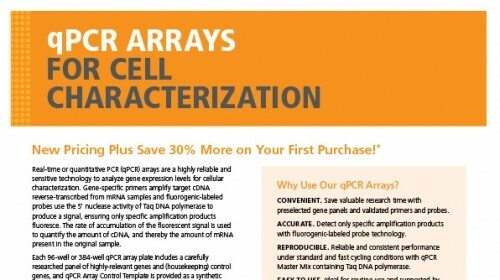 Flow Cytometric Analysis of MSCs Cultured in MesenCult™-ACF Plus Medium. 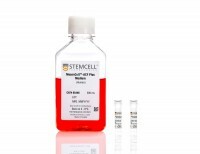 BM-derived MSCs were cultured and expanded in MesenCult™-ACF Plus Medium. At passage 8 MSCs were stained for mesenchymal surface markers (CD73, CD90, CD105,), pericyte marker (CD146) and hematopoietic marker (CD45). MSCs expressed high levels of CD73, CD90, CD105 and CD146 and lacked expression of CD45.